"Find out More about Lake Garda Coach Tours, Local Buses and Transfers"
This is a popular way to have a touring holiday with the main stay being at Lake Garda. Many of these tours also offer excursions to many of the most popular cities and you don't have to worry about driving or getting around. These packages are often very popular with those of more mature years and the can be really good value for money. Quite often you also have the added bonus of seeing great places on your way to and from Lake Garda as well. 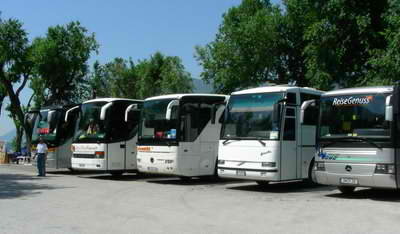 Many companies offer deals on Lake Garda coach tours, so you should get plenty of choice. Some people like to use a transfer to get to and from the airports. They offer a quicker and more personal service and you do not have to worry about using public transport. You would be well advised to book ahead for transfers as this will mean you will not have to wait for one at the airport on arrival and you will also not have to risk them already being booked up!